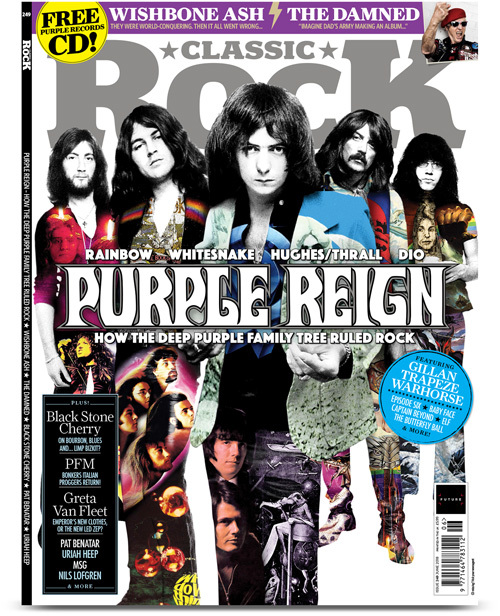 Purple family was heavily featured in the June issue of Classic Rock Magazine, which hit the newsstands in the UK on May 1, and now starts appearing overseas. The issue includes 25 pages about Dio & Rainbow, Captain Beyond, David Coverdale & Whitesnake, Ian Gillan, Paice Ashton Lord, Butterfly Ball, Hughes/Thrall, Warhorse, Trapeze, Roger Glover, Baby Face, Don Airey, Ian Paice, etc, plus a free Purple Records CD. The issue can be ordered via My Favourite Magazines with worldwide delivery. Meanwhile in Sweden, the Sweden Rock Magazine has a 5 pages feature/interview with Don Airey in its May issue. Don tells that he is working on his autobiography and maybe he will have something done in the end of the year. He also said that the years with DP is the best thing ever happened to him and that if the other guys would like to record another album in Nashville with Bob Ezrin, he wouldn’t say no to that. Last time in in Nashville, he went with is son Mike to see Slayer and loved that. After the gig he met the band and two of the guys (King and Araya) told Don that they saw him in Rainbow when they were young kids. Don thought the guys in Slayer were wonderful and the concert was good. Thanks to our editor emeritus Benny Holmström for the info. I like the cover… & it’ll make a great read. Pass me over your copy when you’ve finished reading it, OK?. Just out this month in USA…..bought at Barns and Noble in Moorestown nj…….Yea!!!!! so happy, to take a dump and read some good stories about my favorite band ever.